The Picayune and KBEY 103.9 FM Radio Picayune are collecting toys and donations Dec. 5 for children in need. It’s time for the annual The Picayune and KBEY 103.9 FM Radio Picayune Toy Drive benefiting Highland Lakes Christmas is for Kids, Burnet County Santa’s Helpers, and Granite Shoals Christmas Outreach. This year’s toy drive is slated for 6 a.m.-3 p.m. Wednesday, Dec. 5. We’re pulling the KBEY studio out of the, well, studio and taking it to the streets. You’ll find Ed Chandler and Kay Baker of the “Wake Up Call” broadcasting live from Chevrolet Buick of Marble Falls, 2301 U.S. 281 in Marble Falls. In Burnet, Ben Shields is hosting a drop-off at the Burnet Fire Department, 2002 S. Water St. (U.S. 281). If you’re in the Granite Shoals area, stop by the Granite Shoals Fire Department, 8410 RR 1431 to drop off toys or monetary donations. If you want to drop off donations prior to the day of the drive, you can do so at Galloway Insurance, 100 Avenue H, Suite 101, in Marble Falls; KoKo FitClub, 1400 RR 1431, Suite 120, in Marble Falls; McDonald’s of Marble Falls, 1605 RR 1431; Madlyn’s, 2106 U.S. 281 in Marble Falls; Bulldog Bodywerks, 1304 Buchanan Drive in Burnet; and Granite Mesa Health Center, 1404 Max Copeland Drive in Marble Falls. Or, just drop them by The Picayune and KBEY office at 1007 Avenue K in Marble Falls during regular business hours. The three organizations the Toy Drive benefits — Highland Lakes Christmas is for Kids, Burnet County Santa’s Helpers, and Granite Shoals Christmas Outreach — help make sure children and teens in need have a merry Christmas. And with the recent historic flooding, more families are facing a tough holiday, so every donation helps. The organizations do cross-check with each other and similar networks to make sure people aren’t applying to more than one of the programs. Volunteers at each of the three programs work around the year to raise funds as well as shop for toys and clothes. 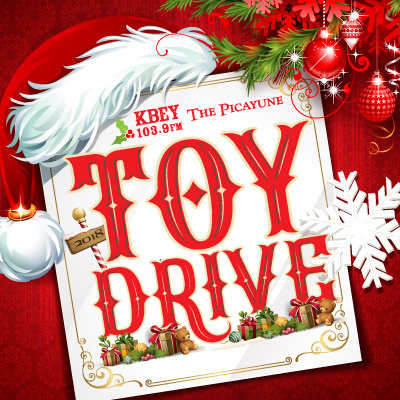 Pick up future editions of The Picayune, tune into KBEY 103.9 FM, or go to 101HighlandLakes.com/Toy-Drive for updates as they come in as far as new drop-off locations.